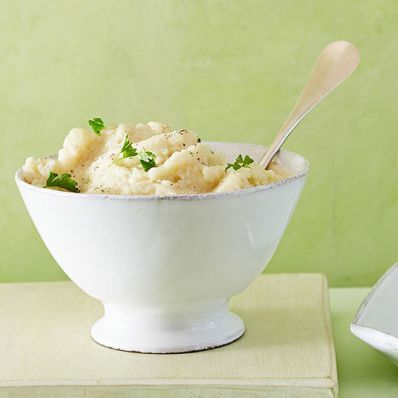 1 of 1 Bring cauliflower, potatoes, garlic and milk to a boil in a lidded pot. Reduce heat, cover and simmer for 10 minutes, until vegetables are forktender. Drain, reserving milk. Return vegetables to pot. Stir in butter and half the milk; mash until smooth. (If too thick, pour in more milk.) Stir in salt and pepper. Garnish with parsley, if desired. Per Serving: 411 mg sodium, 3 g fiber, 5 g pro., 3 g sat. fat, 22 g carb., 5 g Fat, total, 16 mg chol., 150 kcal cal.